I’m pleased to announce that every back issue of Laser and Sword Magazine as well as my digital short, Your Average Ordinary Alien is now available in the Amazon Prime Lending Library for Kindle. If you have Amazon Prime, I’d encourage you to check out “Your Average Ordinary Alien.” it’s a very fun 3,000 word short story read. Also, my full length Superhero Parody novel, Tales of the Dim Knight is only 99 cents as an ebook this month. For Kindle, it’s here. (affiliate link) and for other ebook readers, the book is available for 99 cents on Smashwords. I’ve received an ever-increasing number of e-queries abou Laser and Sword Magazine. I fully intend to do one more issue of Laser and Sword that will wrap up the Rise of the Judge and Order of the Sword series, and Tales of the Dim Knight is already available as a book.� So, we’ll have wrapped up all the serials. What I certainly don’t want to do is leave anyone forever hanging. Does this mean that we’ve given up on the idea of serials? Well, no.� But new technology has made the model with which we purused Laser and Sword somewhat obsolete and unworkable, but with new technology makes serialization more worthwhile as well as more workable. The prices at which we’ve been able to sell Laser and Sword magazine as a paperback book have never been quite satisfactory in terms of being as affordable as old pulp magazines. The electronic end of it is quite a bit more workable, but I don’t think our model of trying to sell three different serials as a package deal makes a lot of sense. The future of serialization will rely on ebook readers and the sale of individual titles and story lines. 99 cent ebooks will revolutionize the distribution of short works in the same way that 99 cent songs have revolutionized the distribution of music. As to the serialization we’ve been posting here, we’ll resume posting new serial parts next week and continue through the end of the year. If we receive feedback indicating the stories are valuable and useful to readers, we’ll continue them. If not, we’ll look towards the future with different focuses. -The Defender prepares for a final showdown with Dark Mystic while Captain Justice and Commander Justice, Jr. search for the localtion of Janus’ hideout with some help from an unlikely source. -Hardboiled illegal casino owner A.L. Snyder has adopted a jaded perspective on life. That begins to change when he finds loves on the streets of Moscow, Idaho. -The Emerald Avenger continues his war on crooked cops. 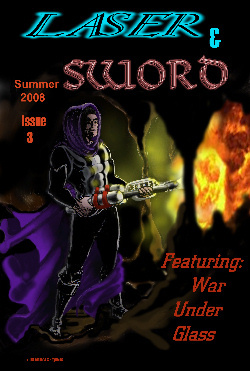 Issue 8 of Laser and Sword is out and available to read on your Kindle. –The Dark Mystic offers the Sword a trade. The price? His soul. At the same time, Commander Justice, Jr. and Captain Justice have to find out why Janus has captured a serial killer and put his fate up for an online vote. –A.L. Snyder faces court martial on charges of insubordination and a prosecutor who has him marked for treason. Can Snyder prove himself innocent and escape the hangman’s noose? –The Emerald Avenger finds police corruption is allowing criminals in Seattle to escape, but Zolgron has a complicated plan to strike back against corrupt police officers. 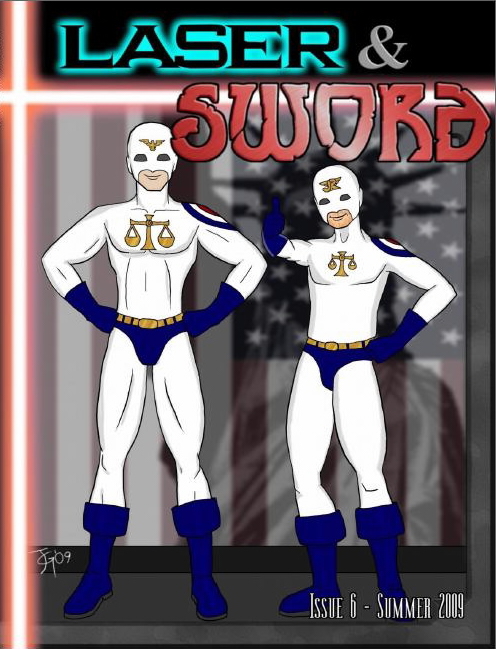 Captain Justice and his grandson, Commander Justice, Jr. search for Earth’s missing heroes, while the Sword ponders a mysterious invitation from the Dark Mystic. Millions are imperiled when Snyder’s efforts to track down the Zero cult are frustrated by Colonel Dread locking him up on trumped up charges. Issue 7 is available for $8.03, the ebook cost on Lulu is $2.74. Cooming soon: The Laser and Sword Annual Edition. Marcher Lord Select has begun to register�people to vote in the Marcher Lord Select contest, billing itself as the American Idol of Christian book publishing. I’ll be entered the Premise Contest, with a prize of a priority reading. To help support Andrea and I’s Premise, “Genesis of Judgment,” you must register and vote for two other premises as well as ours between �November 13-15.� More information on the Marcher Lord Select process is here. Yes, I know the print price is ridiculous. That would be Lulu’s fault. If anyone knows a cheaper printer, we will consider the tip. Our Latest Issue is out! -The apparent murder of the Russian hero, Defender sends eighteen inch tall hero, Small Packages, on a quest to find the killer. Meanwhile, after being retired for 13 years, can Captain Justice make a comeback with Earth�s heroes gone? -Jirel has to act quickly before a fem fatale kills again. Her next target:� Private A. L. Snyder. -Powerhouse faces the Invisibility Master, while Marcos and Night Lord close in on the Reverend. What will happen in these stories? The answer is only one click away. Spread the word. 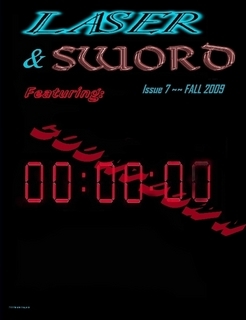 Issue 3 of Laser and Sword is out with another awesome cover by Melinda Reynolds! �This issue, the Dark Mystic intensifies his campaign of terror against the Order of the Sword. The Sword journeys onto Dark Mystic’s home turf while Payday lays a trap with Speedskater as the bait. Meanwhile, A.L. Snyder finds himself hanging upside down, held by a mysterious man who claims to know Snyder’s father.� Jirel discovers what the unknown mission is, but finds his rogue helpers reluctant to get involved. Powerhouse, failing to find major criminals in his hometown goes after jaywalkers and other minor technical violators of the law in his search for something to do.